Lily of the Mohawks was born in 1656 and baptized Catherine Tekakwitha in New Netherlands, New York. Kateri’s (which is Mohawk for Catherine) mother was an Algonquin that was captured by the Mohawks and married a Mohawk Chief. At the age of four Kateri contracted smallpox and left her disfigured. Although she survived, her parents did not and she was raised by her uncle, a Mohawk Chief. At the age of 19, she converted to Catholicism and escaped to Montreal. She lived a prayerful life to her death at the age of 24. Kateri Tekakwitha was canonized by Pope Benedict XVI on Oct. 21, 2012; becoming the first Native American Saint in the Roman Catholic Church. 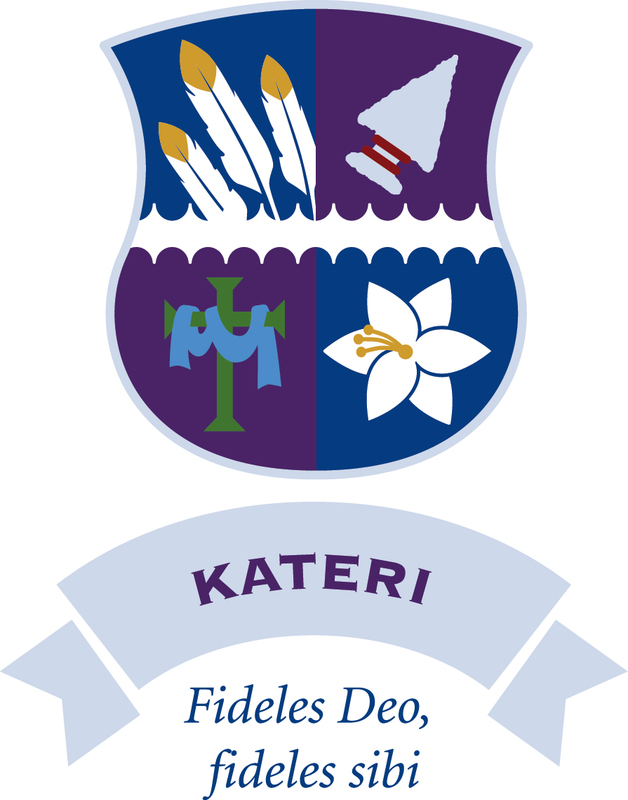 The Kateri House crest is comprised of four symbols that represent St. Kateri’s life and her profound example of faith. St. Kateri was known as the Lily of the Mohawks, a tribe native to the New York area. The arrowhead is a symbol of the Mohawk people. The white lily, a traditional symbol of chastity in religious art, recalls the vow of perpetual virginity St. Kateri made near the end of her short life. St. Kateri was deeply devoted to the cross. She is often pictured gazing at a cross or holding one. The cross we chose for our crest is the same cross found on the seal of the Society of Jesus, which can be seen on the Jogues House crest, because Jesuit missionaries evangelized St. Kateri and supported her conversion. The cross is green because St. Kateri is a patron saint of the environment, and the blue cloth draped around the cross is a symbol of her personal suffering. St. Kateri lost her family to smallpox when she was four years old, and the disease left her vision damaged and her face badly scarred. St. Kateri would cover her face with a blue shawl to hide the scars. These scars miraculously disappeared when she died. St. Kateri is the first Native American to be canonized, and she is also the patron saint of Native Americans. The feathers are a symbol of Native American spirituality; there are three to express her faith in the Holy Trinity.